Today, many in the movements for sustainable agriculture and just food systems rally around the call to eat and buy local. Local food production whether from a nearby organic farm or urban community garden has been embraced as a means to promote environmental sustainability and community-based social change. This move has been most noticeable in Northern California where alternative food initiatives have proliferated since the 1980s. 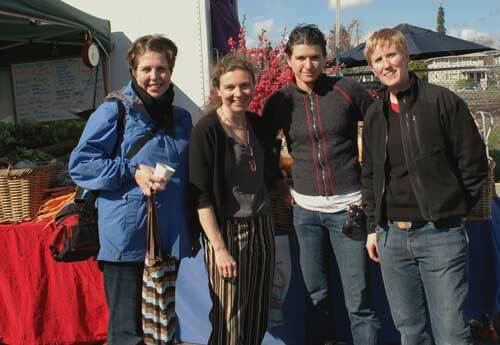 In June 2005 during the San Francisco celebration of World Environment Day, Jen Maiser, Jessica Prentice, Sage Van Wing, Dede Sampson, and a group of Northern Californian women unveiled a challenge entitled "Celebrate Your Foodshed: Eat Locally," or simply, "The Local Food Challenge." The challenge was to spend a month eating only food produced within a 100 mile radius of your home. The women called themselves the "locavores" and encouraged others to join them in their quest for a more sustainable food system. For these women, and many others in the sustainable food movement, our globalized food system presented serious problems for the environment from pesticide pollution to excessive use of fossil fuels. Additionally, they argued, food produced in industrial systems was less healthy and less tasty, while purchasing meant money that could be spent on local business ended up contributing to global threats to sustainability. The authors of the Challenge contended that while organics may once have been a way to find sustainable food options, already by the early-2000s the description (or label) of organic could apply to food produced on the other side of the world on an industrial farm. Local farms, the authors argued—with the small, family farms of Northern California in mind,must go beyond organic to use a variety of agroecological farming practices. The Challenge encouraged participants to follow a set of guidelines that enabled them to eat food produced within the Bay Area foodshed. A term used first by Kloppenburg et al., "foodshed" derives from the bioregionalist idea of a watershed, as a metaphor to be used to unite people and place. A foodshed, they argued, can create connections between the cultural and the natural: “In this unstable, post-modern world, the foodshed can be one vehicle through which we reassemble our fragmented identities, reestablish community and become native not only to place but to each other. "1 For the locavores, promoting sustainability through local food consumption goes beyond protecting the environment to asking how they, as leaders of this challenge, encourage a better quality of life in their local community. Here they also built on the message of the California-based Community Alliance with Family Farmers' "Buy Fresh Buy Local" campaign, launched in 2002. 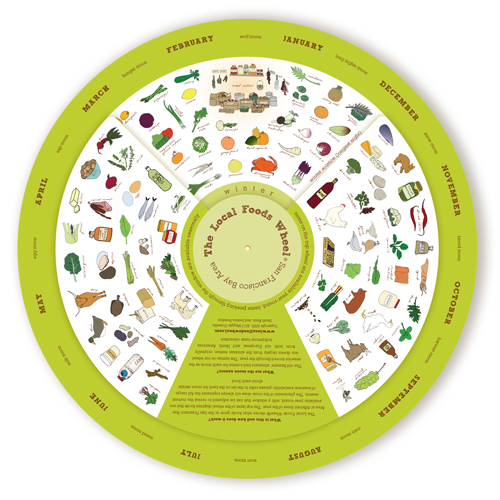 The San Francisco Local Foods Wheel shows what's in season and local within about 150 miles of San Francisco. Similar wheels have since been made for Southern California, the Northeast, and Midwest. After launching their own Locavores website, the original creators went on to extend the concept in various ways. Dede Sampson moved on to Bon Appetit Management Company, becoming chef coordinator at the teaching kitchen on the Google campus. Jessica Prentice co-created the Local Foods Wheel, helping people conceive of their foodshed seasonally and across all food groups. Perhaps most significantly, locavore was embraced by sustainable agriculture movement activists, as well as those in the "food" and "foodie" movements more broadly. It was picked up by food writers, restaurant consultants, and famous chefs—including Alice Waters of Chez Panisse, who is synonymous with California regional, organic haute cuisine. In 2007 Barbara Kingsolver used it in her popular book Vegetable, Animal, Miracle, a chronicle of her family’s attempt to eat a local diet. Also in 2007, locavore was voted “Word of the Year” by the Oxford American Dictionary, and defined a “a person whose diet consists only or principally of locally grown or produced food.” At the same time, Buy Local campaigns, farm-to-institution programs, and other local-food efforts were receiving increasing attention both in Northern California and nationally. As a strategy for social change many have debated the promotion of local consumption as the basis for a social movement. While many argue that locavores exercise the power they have by voting with their dollars, others have argued that local consumer campaigns favor those with greater economic means, as well as favoring individual action as opposed to collective action. To focus on the power of the individual consumer, social movement actors may be replicating politics of neoliberal globalization that promote market-based solutions to social problems, individual responsibility, and a de-emphasis on state regulation to problems such as the overuse of pesticides.3 Michael Winter adds to this analysis of local food purchases by empirically studying five rural localities in England and Wales. The study found that local purchasing represented a defensive politics of localism that was more motivated by supporting the local economy than realizing environmental change.4 Alternatively, these campaigns might challenge commodity fetishism by highlighting the social-natural relations of production (Allen and Kovach 2000). By contrast, many local food advocates have argued that foodsheds can be a site for democratic reclamation of political power. Harris (2008) echoes this conclusion, citing the work of JK Gibson-Graham. The author uses their technique of “reading for difference” to argue that local food politics engage activists in envisioning and practices economic relationships beyond neoliberal capitalism. Harris warns that academics can “play a significant role in the reproduction of neoliberalism-as-hegemonic-discourse” (2008, pg 58). Through the study of individuals participating in the 100 Mile Diet, Harris concludes that through educating themselves, these individuals try to recreate themselves as subjects not hailing to dominant discourse but to ethical concerns in the food system. Gibson-Graham argue that these forms of re-education and re-imaging may be most supported at local scales (2001). Allen argues that “more participatory democracy at local levels is absolutely necessary to work toward an environmentally sound and socially just agrifood system, but it in and of itself is not sufficient because some voices drown out others” (2004, 171). Historical differences in access to power, wealth and voice based on geography and demographics exist in all communities (2010). Conducting ethnographic research at two farmers’ markets in northern California, Alison Alkon and Christie McCullen found that the dominant white discourses are perpetuated. A lack of attention to structural problems and to the historical conditions that have led to the problems they seek to ameliorate, can ironically permit locavore activists to reinforce or replicate unjust systems. While there are several limits to the potentials of creating just food systems through the strategy of only focusing on the local, at the local scale actors can create discursive and physical space to experiment, reflect and work towards alternative social structures. 1. Jack Kloppenburg, Jr., John Hendrickson and G. W. Stevenson, "Coming in to the Foodshed." Agriculture and Human Values 13:3 (1996): 33–42. 2. Melanie Dupuis and David Goodman, “Should we go ‘home’ to eat? : toward a reflexive politics of localism”, Journal of Rural Studies 21 (2005): 359–371. 3. See Dupuis and Goodman, also Julie Guthman, “Neoliberalism and the making of food politics in California,” Geoforum 39 (2008): 1171–1183. 4. Michael Winter, “Embeddedness, the new food economy and defensive localism,” Journal of Rural Studies (2003), 23–32.